Bank is working to clear backlog created after last week’s technical glitch. 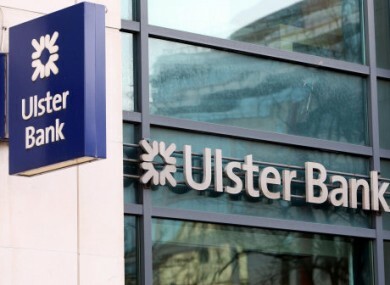 ULSTER BANK HAS said that full services will be restored to normal for the start of next week as it works to clear the payments backlog which built up over the past week due to a technical glitch. The bank says that electronic payments are being received into accounts, but that electronic payments to accounts made between 20 June and 25 June may be delayed. Cash or cheque lodgements made in Ulster Bank branches from 20 June “are receipted but are yet to be credited to customers’ accounts and will be credited as we clear the backlog,” according to the bank. Bill payments made in branches from 20 June may also not have been processed yet and Ulster Bank says any customers who incur fees or interest as a result, should contact them. Dozens of Ulster Bank branches will remain open until 7pm throughout this week to help facilitate customers affected by the technical issues. A helpline is in operation from 8m to 10pm on1800 205 100 (or +353 9156 2910 if calling from outside Ireland). The RBS Group, Ulster Bank’s parent bank, said yesterday that account balances had been “cleared overnight” at RBS and Natwest, which also experienced the IT glitch. Meanwhile, The Register reports that a source familiar with the situation said that a serious error by an inexperienced IT operative caused the error while updating batch processing software. Email “Ulster Bank: Full services will be back to normal by Monday”. Feedback on “Ulster Bank: Full services will be back to normal by Monday”.